If necessity is the mother of invention, then freezing cold winters in Poland necessarily gave birth to mulled beer. Not wine (although there’s plenty of that too) but beer. I’ve long been a fan of mulled or gluhwein, that staple of Christmas markets in northern European Medieval capitals. But hot beer was a new one to me. We discovered it in arty, cultural Kraków (also known as Cracow or Krakow) Poland’s second largest city after its capital, Warsaw, and located in the south of the country. Hot beer, or grzane piwo as it’s called, is a staple of the Polish winter, something to not just delight tourists beating a path around the streets of the Old Town, but essential to the survival of its residents. It’s not just warm beer, of the sort served in British pubs in the 1970s, but mulled beer – a brew that has been heated and infused with cloves and cinnamon plus other spices and herbs such as nutmeg and either fresh ginger or ginger syrup, sweetened with honey or sugar. It’s considered good for you too – there are tracts dating back to the 17th century which enthuse about the healthy properties of a warm frothy tankard of the stuff. While the barrel-shaped huts in the main square’s Christmas Market served mulled wine (the perfect accompaniment to a large pork knuckle or Polish dumpling, with the fresh air acting as a powerful aperitif) we found the beer in several restaurants including the Czech restaurant Ceska Chodba – yes, we went to Poland and, tempted by the rich roasted goose, ended up eating in a Czech restaurant. 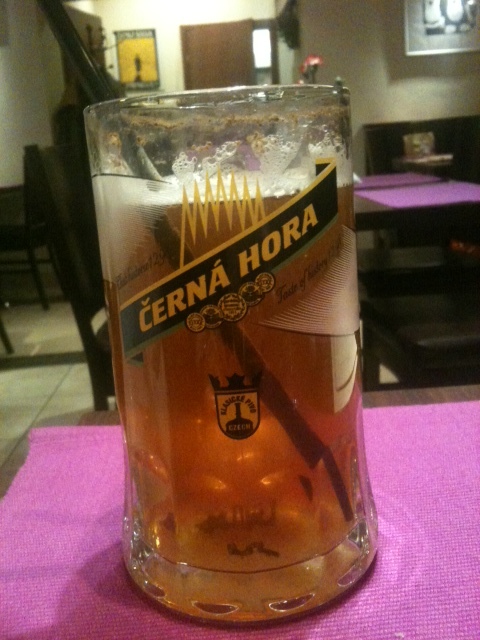 Mulled beer turned out to be the perfect accompaniment to a festive winter goose, served with a mushroom and prune sauce along with nutty buckwheat groats (the Cerna Hora photo shows the brand of Czech beer that was served warm/mulled in the restaurant). 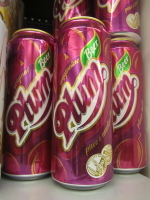 In Poland, prunes are big, as are plums – in popularity and ubiquity, if not necessarily size – and, for a nation that takes the time to mull its beer, it’s unsurprising that the Polish have thrown their considerable brewing expertise into creating a wide and varied selection of beers. You can find beer with ginger (not, you will note, ginger beer, but actual beer with the addition of ginger), alongside the plum beer and honey beer which you can find in off-licences and liquor stores (you’ll recognise them from the giant Alkohole signs outside) as well as supermarkets. The other hot alcoholic beverage we tried was mead (honey wine), which we found in a Medieval-themed restaurant – possibly making us the first people to get mead hangovers since 1485.